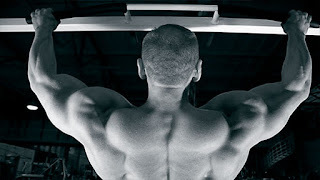 Want to work on your pull-ups and widen your lats? The following is a pull-up/back specialization workout called the "Pull-up Potpourri Routine." The Potpourri Routine is a forgotten bodybuilding workout that predates the invention of sets. It is the 1920's version of German Volume Training and was a favorite of John Grimek. In potpourri training, you perform 10 exercises for a muscle group, but only one set per exercise. The Potpourri Routine works best as a muscle specialization workout. So if you wanted to bring up the size of a muscle group lagging in size, you could apply this 10 exercises/1 set each method to a muscle group. Q:What do you think of muscle-ups? I'm not able to do a muscle-up, even though I can do 10-15 strict pull-ups. Any advice on how to do them? My Answer: Muscle-ups are a great multiple compound movement, sort of like a calisthenic version of the clean and jerk. It takes quite a bit of explosive strength to do the muscle-up. Unfortunately it is very hard on the joints, namely the elbows and shoulders. Repetitive muscle-ups (along with kipping pull-ups) are responsible for a lot of CrossFit injuries. L-sit pull-upsWaist pull-upsStraight bar dips. Practice the L-sit pull-up, pulling the bar to your chest. Over time, pull the bar farther and farther down your torso, from your chest to your stomach and eventually to your waist. Q:"I am from Australia and just finished reading your article on widening your back. I am currently training to increase my back size but am crippled with a right shoulder injury due to a tumor being removed from it hindering me from doing heavy shoulder exercises and compound exercises which include the shoulders. "I want to do pull ups, but the strain on my shoulder stops me from doing so. Do you recommend I use a weighted pull up machine to help me pull myself up? The stiff arm pull downs will be included in my routine from now on.